Alpine announced its first aftermarket in-dash receiver with support for Apple’s CarPlay feature for iPhone users. The new Alpine iLX-007 will be the company’s first display to support CarPlay following Pioneer’s rollout of the feature to its latest NEX displays earlier this month. Alpine’s new in-dash receiver features a 7-inch capacitive touch screen comparable to Pioneer’s high end NEX8000 CarPlay compatible model ($1,400), but at a much lower price point of $800 as it lacks other hardware features. 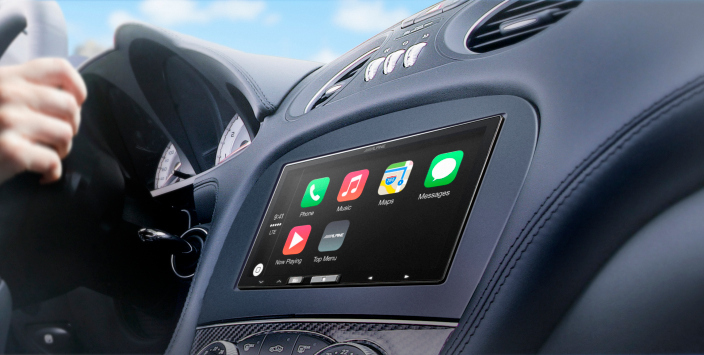 Earlier, Alpine Electronics announced that it will offer aftermarket products compatible with Apple CarPlay, further enhancing the connectivity between the iPhone® and Alpine’s in-vehicle environment. Alpine’s CarPlay offering is still one of the first on the market yet and joins Pioneer in allowing drivers to have CarPlay without buying a new car. Several automakers have already announced CarPlay availability on certain models of new cars, some of which are already on the road, but will require firmware updates in the future before CarPlay is present. While Pioneer’s CarPlay-compatible aftermarket receivers received firmware updates to certain existing units already on the market, Alpine’s approach is closer to a dedicated display intended for use with the iPhone and CarPlay with a button on the unit dedicated to Siri. Both Apple and Alpine announced earlier this year that CarPlay would be coming to the aftermarket displays this fall. CarPlay is available for iPhone 5, iPhone 5c, iPhone 5s, iPhone 6, and iPhone 6 Plus with iOS 7.1 or higher. CarPlay currently supports iPhone apps including Phone, Music, Maps, Messages, and Podcasts as well as iHeartRadio, Rdio, and Spotify. Additional apps are promised including Beats Music, MLB At Bat, CBS News Radio, and Stitcher. Alpine says its new iLX-007 in-dash receiver is now available through select authorized Alpine retailers with a suggested price of $800.